UCLA English department eliminates Shakespeare requirement, conservatives freak out. Yet another conservative commentator is decrying English departments falling to “victimhood” studies. Too bad it’s not true. 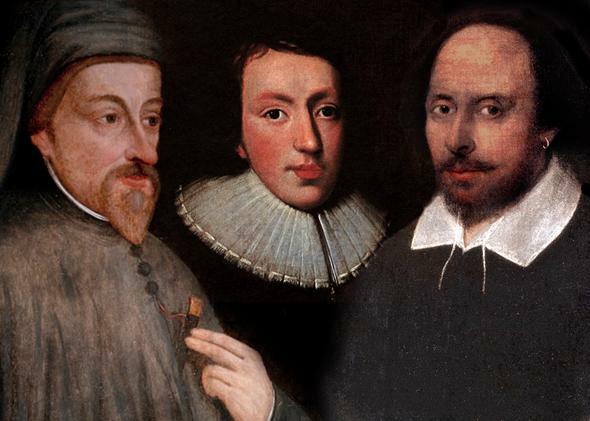 Chaucer, Milton, and Shakespeare: three “timeless” guys. Literature students have a brand new “classic” to study: the Political Correctness Killed Shakespeare article. The most recent inductee to this august canon, currently riling up the academic Internet, is by Heather Mac Donald in the Wall Street Journal. Mac Donald is deep in the throes of grief over the death of the humanities’ humanity: According to the op-ed (a reprint from the Manhattan Institute’s City Journal, making it the perfect storm of neoconservative pearl-clutching), the Day the Literature Died was in 2011. Was that the day Geoffrey Chaucer was posthumously baptized by the Communists? The day the lesbians (all of them!) invaded Stratford-upon-Avon? Worse: It was when UCLA’s English department did away with their single-author course requirements in Milton, Shakespeare, and Chaucer, and added some breadth requirements that include perspectives on gender, race, ethnicity, sexuality, transnationalism, and—gasp—creative writing. Never mind that UCLA probably got rid of the three single-author course requirements because single-author courses are tough to teach, and can be murder to take (guess what? Not everybody likes Chaucer enough to spend 15 weeks on him, and that’s OK). Never mind that the UCLA English major still requires plenty of historical literature classes, including Shakespeare, Chaucer, and Milton. Never mind that students don’t actually have to take a gender or race studies course, as they’re two of several options for fulfilling the breadth requirement. Those are but irrelevant facts, but since said facts involve giving students a choice to take a course on Queer Literature since 1855 (Tennessee Williams? James Baldwin? Gertrude Stein? Oh no! ), they surely herald the continuing descent into Gomorrah. Don’t you know that this minor curricular shift (that happened three years ago, since which time nobody, to my knowledge, has perished of area studies) is nothing less than truth-and-beauticide? And in favor of what? According to Mac Donald, who graduated from Yale in 1978 and, to my knowledge, has never taken an undergraduate English class at UCLA, a whole lot of victimization. Mac Donald (and before her a he-swears-not-stoned David Brooks) chides the literary disciplines for losing “timelessness” in favor of contemporary critique. Timelessness? Anyone who has taught Dante’s Inferno (as I just did to my freshmen) knows that every canto contains some now-opaque reference to Dante’s personal enemies, or Pope Boniface VIII, or that timeless political party the Guelphs. In Chaucer’s Canterbury Tales (which I also just taught to my freshmen), much of the Wife of Bath’s Prologue is devoted to rousing debate about Jovinian, whose views on marriage got him excommunicated from the Church in that timeless year that everyone remembers: 393. And do you know what play was written largely to placate his audience’s new fascination with all things Scottish? Shakespeare’s Macbeth—which, again, I just taught to my freshmen, alongside such “politically correct” work (or “masterpieces of world literature;” tomato, to-mah-to) as The Epic of Gilgamesh, The Bhagavad-Gita, and the Tao Te Ching. Because listen. No literature, if it’s any good, is timeless. Ever. It is of its time—and, in order for students to be at all interested in reading it, it is of ours as well. That does not make it “timeless.” That makes it nuanced. For example, when my students recently read nonexplicit excerpts of the Kama Sutra, they were aghast that the text condoned “forcibly carrying” a girl away as a legitimate form of marriage. They, not I, brought up their objections in class, and a terrific discussion resulted on sexual consent in the fifth century BCE. So here’s a big surprise: this incessant litany of “English killed Shakespeare” articles? They’re actually—ahem—full of sound and fury, signifying nothing. Not only are rumors of the English major’s demise greatly exaggerated, but any actual drop in majors in recent years has little to do with the death of the classics and more to do with the fact that English—even when it’s semester-long Milton classes—doesn’t train one to be an engineer. So why the constant need to Frankenstein together an area studies boogeyman? Why keep lambasting that mythical English professor who says nothing but “subaltern” all day and hasn’t even read Paradise Lost because it’s the verse of the hegemony? Why make entire movies taking down the oh-so-common atheist philosophy prof who will relish failing anyone who insists that “God’s not dead”? The Mac Donalds and Brookses of the world decry a discipline that’s abandoned the classics in favor of playing the victim. And yet their gesture—one that will be repeated by countless derivations of the same argument in years to come—is itself a triumphant coopting of the very manufactured, hyperbolic narratives of oppression they oppose. It’s poor, helpless Shakespeare against a rising tide of James Baldwins (he was Black and gay, so, doubly oppressive). It’s the Manhattan Institute against a rising tide of literate poors who dare question the politics of privilege. Yes, the authors of these articles may bemoan the largely imaginary teaching of “victimhood” in college literature courses—but in reality, they could lead the master class.